The RAV4 is one of the safest vehicles in its class, making it one of the top competitors in the crossover SUV segment. The RAV4 offers comfy interior, an abundance of safety features, dynamic exterior, high grade performance and styling. 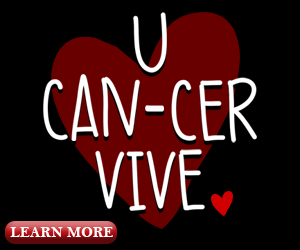 A new car isn’t just all about the looks, it’s about the peace of mind for a safe drive. Drivers want safety to be a priority when it comes to choosing their next vehicle. 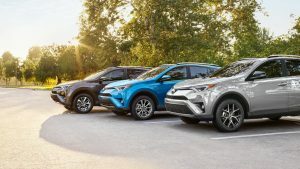 Toyota gives drivers ease by implementing the top features in the all new 2019 RAV4. It is equipped with Blind Spot Monitoring, Star Safety System, Eight Airbags, Toyota Care, Automatic High Beams, Pre-Collision System with Pedestrian Detection, Dynamic Radar Cruise Control, and Lane Departure Alert with Steering Assist. Not only is safety a huge factor in purchasing or leasing a new vehicle, the utility and convenience of a vehicle too. The RAV4 makes loading cargo easier than ever before. The hands-free foot-activated power liftgate senses our Smart Key Fob and opens when waving your foot under the center of the rear bumper. Along with that, in the rear of the vehicle, you will find a 120V rear cargo area power outlet that will power up your gear so you can keep the fun fully charged no matter how far your adventure takes you. Another key feature is the ability to reconfigure the rear seats to create a wide, easily accessible load space with up to 73.4 cubic feet of cargo capacity. All of these key features help make any adventure worth while! 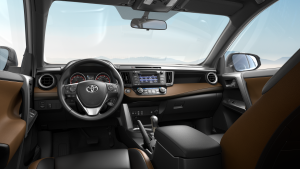 The RAV4 continues to set sights higher with the premium interior and technology. Depending on the trim level, heated and power adjustable front seats, power moonroof, integrated navigation, Entune Audio Plus,SiriusXM, and Siri Eyes Free are all available. These features are a must when searching for a new vehicle. The RAV4 is one of the world’s most popular cars due to its capabilities and features. Check out the all new RAV4 at LaFontaine Toyota in Dearborn today!